A couple of years ago I was grieved to hear that pastor, author and speaker Dan Kimball had officially separated himself from Emergent Village---the "organizational" aspect of what people were calling the "Emerging Church." Kimball was one of the main reasons why I started self-identifying as an "emergent" church leader, and heavily influenced my development as a preacher and teacher through his creative approach to multi-sensory worship, and his postmodern approach to transforming existing churches. So when I heard that Dan no longer felt that he could be a part of Emergent Village, I assumed that it had to do with his Baptist background, which probably imbued him with a great deal of suspicion toward more theologically progressive Christians. His separation was gracious, however, and I continued to read his books and occasionally hear him speak. But I never understood why he felt it necessary to disassociate from the movement he was such a part of from it's beginning. A couple of years ago, I had a few of my blogs published on the Emergent Village website. I was thrilled. For several years I'd been immersed in books about the emerging church, emergent theology, emergent worship and the like. I'd attended several conferences where Tony Jones facilitated workshops and emergent luminaries like Diana Butler Bass, Phyllis Tickle and Brian McLaren were featured speakers. So basically I was all in. When an emergent movement took wing in my own denomination---the Presbyterian Church (USA)---I was more than a little excited and eagerly wanted to be a part of it. 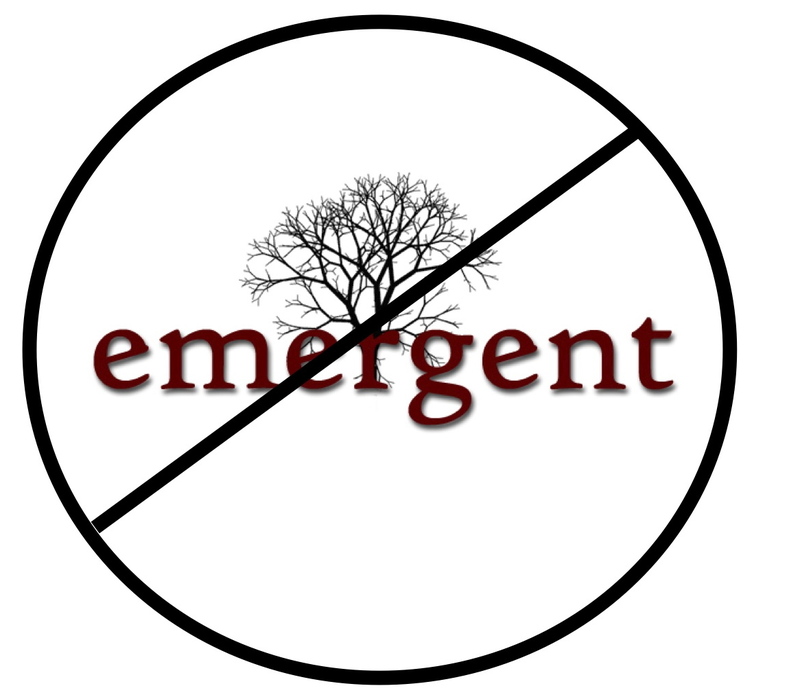 My hope for the emergent conversation was that it would bring about wholesale change to what I saw as the "Existing Church," an institution that had become cumbersome, tired, stuck and dying. Additionally, I wanted to see the emergent conversation as a path to openness, innovation and vibrancy for the whole Church. I was also disillusioned with the way that the Religious Right had co-opted conservative politics into the very fabric of mainstream Christianity in America. I thought that Emergent Village and the subsequent "denominational" emergent movements would help shepherd the Church into a new era of relevancy and dynamism. Based on what I saw early in the movement I thought we would see a shift in the way the church practiced evangelism. I thought that we would see a call for engaging, creative and innovative preaching. I thought that we would see a revolution in worship. I thought we would genuinely see churches become less interested in self-preservation and more in sharing the Good News. I thought a lot of things. What I discovered was something altogether different. Just as the Religious Right co-opted the language of conservative politics as its second "canon," the Emergent movement has done the same with liberal politics. For example, the only issue in the Church that seemed to completely energize the Presbymergent group that I used to be loosely affiliated with was passing an amendment to the Presbyterian Church (USA)'s constitution that would allow the ordination of homosexuals. Once that was accomplished, I don't really think the group knows what to do any more. I still follow quite a few Emergent-y "leader" types on Twitter. I read their blogs on occasion, and when they publish a new book, I usually will buy it. I've reviewed several on this blog, and enjoyed them immensely. But many of the Emergent-y types seem to care very little about the revitalization of the Church. They have spent so long deconstructing it that they don't know much else. So now they spend their time twittering, blogging and speaking about politics. They've become the Left-leaning versions of what they once hated. The same people who were witheringly critical of the way conservative Christians blindly lionized George W. Bush (and many of them did--and still do), shower Barack Obama with praise in near-panegyric ecstasy. Listen, I'm not offering these issues up for debate---only for the purpose of making my earlier point: the Emergent-y types have become the Religious Right---of the Left. They've lost the plot. And I don't want to go where they are going any more---if I ever did. When Dan Kimball graciously withdrew from Emergent Village it made news. No one will really care about this little missive of mine. That's okay. I needed to say it. I also need to say this: Pastors don't belong in politics. I used to feel differently about this, but I've now seen how easily it corrupts both conservative and liberal Christian pastors, and distracts us from what should be our number one calling: leading our flock. It also sets us up as lightning rods for division and controversy when we should be instruments of peace. If you are a pastor and you feel like you absolutely have to spend your time commenting, twittering, blogging, speaking, etc. about politics both within and without the Church---maybe you should become a full-time blogger, twitterer, writer, speaker or whatever. But if you're a pastor, be a pastor. Read Eugene Peterson's book The Pastor, if you need some insight on what that really means. I did and it ruined me. Listen, if you feel a burning in your heart to address an issue, or to right a wrong, or to speak out against injustice---do it in a sermon. Preach from the Word, and not from the New York Times editorial page or The Weekly Standard. Let the Scripture do the talking and the Spirit do the convicting. Meanwhile, I'll keep hoping that the vision I had so long ago when the emergent conversation started will one day be realized, and the Church will be reformed. But now I'll lay my political tweets, facebook status updates and blogs to rest. I've got a sermon to prepare. I noticed this last year when I attended the Theology after Google conference. I was disappointed how much was tied to progressive theology and politics and how much anger there was towards anyone else. In that setting, begin emergent also implied being liberal.